I know I promised a Wildstar addons corner about the different mouselook addons, but alas, I did not have time for personal reasons, and then decided that a look at social addons is maybe more necessary than mouselook. 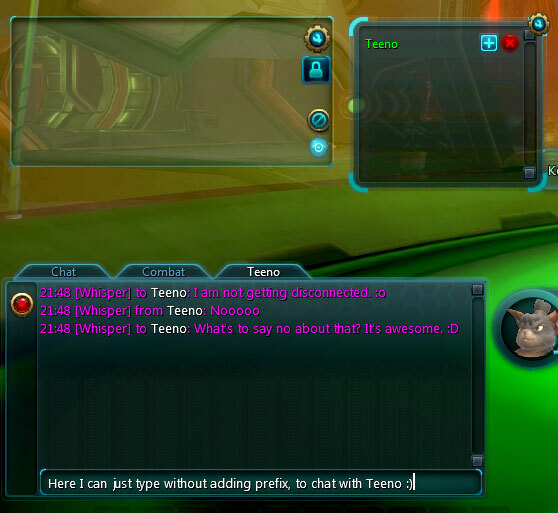 Let’s face it, the default UI of Wildstar is really not great when it comes to allowing you to easily have whisper conversations with fellow players. 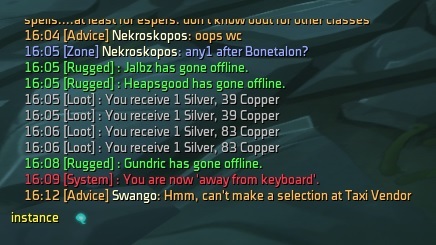 It’s incredibly easy to miss whispers completely, and it’s awkward to respond to them. I wish the Innate wasn’t bound to R, just saying. Ctrl-R to respond to a whisper is hardly intuitive. But thanks to addons, there are ways to keep in touch with friends and random folks that might eventually turn into friends. I’ll try to make this comprehensive, but if I miss any chat addon you really enjoy, please leave a comment. Sharing is caring! Note: I have net issues today that don’t actually allow me to log into Wildstar, as I keep getting disconnected. Of course this has to happen on a holiday weekend. 🙁 I will add more screenshots as soon as I can take them in-game. 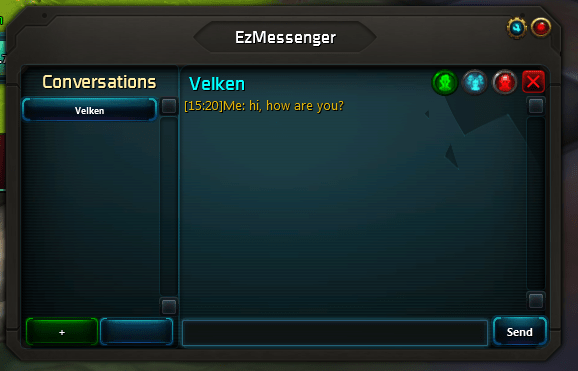 While not a chat addon itself, EZSocialBar is the first step after logging in that I check. It’s a small, moveable bar frame that lets you see at a glance how many of your friends and guildies are online atm. When you mouse over each section, you get a tooltip showing you which friends/guildies are online. It’s not as fancy as my favorite WoW equivalent yet, but it works. A click on friends/guild opens the social menu or guild roster. The author is currently working on adding more circles functionality. It can already display circles, but doesn’t have a tooltip for them yet. I keep this bar in the upper left corner of my screen. 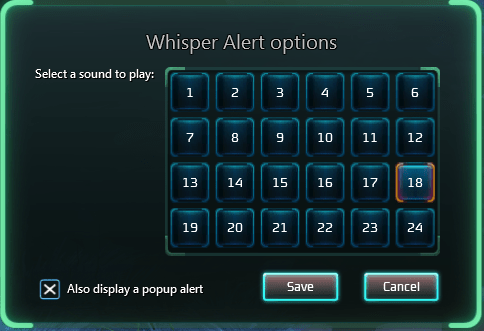 Wildstar’s default whisper sound is practically non-existent for me. It might be because I have had tinnitus for years. I need a clearer alert. Thankfully, Whisper Alert does exactly what the name suggests. When you use the only command option, /whisperalert, it opens a window where you can pick one of 24 different sound options. These options should contain something for everyone. Definitely a big help for me! 24 different sounds to choose from. Clicking on the numbers lets you hear the sound and choose. My personal favorite amongst chat addons. Whisper Catch adds another small window to your screen that will popup with the name of whoever is whispering you. If the name is green, you responded, if it’s red with a number in brackets behind, that’s the number of whispers you missed. When you click on the + behind the name, you go to a chat tab that’s specifically dedicated to this conversation. You don’t need to add any prefix in that tab, you can simply type away, and the whisper will go to the right person. I find this soooo helpful! It’s not perfect though. It’s not as perfectly maintained as other addons and hasn’t received an update since launch. It doesn’t play nice with other addons that modify the chat frames in any form and then tends to fail. I can’t use Improved ChatLog if I want to use WhisperCatch, e.g. It supposedly has a hide window button that I have never seen. Still, it does exactly what I need, and I can deal with the window. If you are running addon light, and are just looking for one chat addon, this might be awesome. I love it and hope it will continue to be maintained. This is the window you can freely place on your screen. It’s alerting me to 1 whisper from Teeno. If you prefer, you can have it display account friend names where available. This is the chat tab it creates. You can just type away. Window shows I responded to whisper, making Teeno’s name green. An IM-style addons that works as a separate chat window. All chats will be handled through that window. You can minimize it into a short bar that will alert you to new messages. I tried it initially because I really liked the looks of it, but in practice found the chat window far too bulky, taking up a lot of screen estate. The dev is active though, so there might be improvements on that front. I know people like Jaedia really enjoy using it. The conversation window. I wasn’t able to find the resize option, and felt it took up too much space. Next, I have a bunch of addons that change aspects of the chat log. We’re starting with BetterChatLog. This addon does one thing only: changes the font of the chat log. I found the font a lot more readable, however, it didn’t play nice with WhisperCatch, so it had to go again. Alternatively, you could use ImprovedChatLog which basically seems to be the same thing. I also wasn’t able to make this work together with WhisperCatch. There’s also Fixed Chat Log, also very similar, but additionally keeps the profanity filter turned off by default. Just a different font, that’s all that this addon does. I suppose one could edit the lua file as well to pick a different one, but I am not sure. For those who are coming from WoW and miss the colors they are used to, there’s WoWChatColours. It colors everything but timestamp and channel name in the colors you are used to from our MMO behemoth, and additionally lets you use a color picker to set colors. Or colours. As you like it. And that’s it for now. If I stumble upon cooler chat addons, I will return to this topic, because with a fresh MMO, I find it more important than anything to communicate properly with people. Yay, this is the post I was waiting for! Now to decide which to try first! I didn’t review the WIM addon because it hasn’t been updated since API 7, and we’re on API 8 atm. Will have to have a look at ChatFontSize. There’s also another IM style addon that received an update today, ZChat, but same issue, looks really bulky.